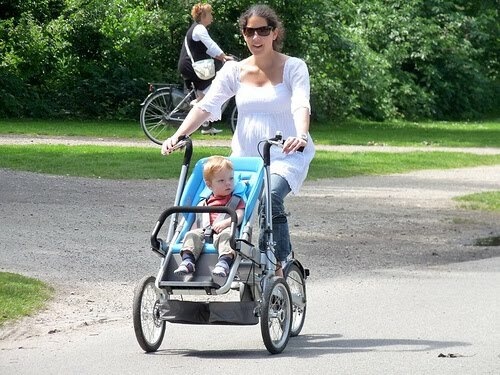 Fit Fluential Mom: The Taga Bike & Stroller in One! Are you looking for a versatile product that will give you a bicycle, stroller, jogging stroller, shopping cart and child wagon in one? Well, this great new product will give you that and more! It's incredible. It's the ideal product for moms and dads that would love time to exercise and do it with baby in tow! Some parents would love to put their baby on a bike seat or in a trailer and ride around town on a nice sunny day but feel it's unsafe because a bicycle is not very stable being on only 2 wheels. 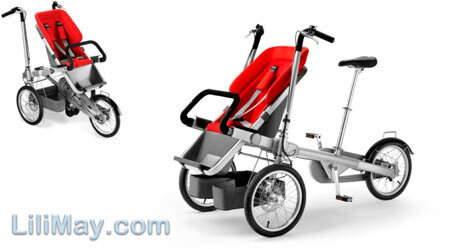 Well, the new Taga Bike & Stroller has solved that problem for you. If you're looking for a new safe and fun way to exercise alongside your little one, you have to try it out! This is definitely not an accessory that I'd consider affordable since the single version starts at $1,494. It is, however, an incredible design that virtually gives you 10 products in one with all of the options. When you consider that you're gettinga bicycle, a stroller, a car seat stroller, a shopping cart, a bicycle with a built in child stroller seat, an option for 2 child stroller seats on one bike and an option for a wooden wagon on the bike... what more could you ask for in a product? Some strollers alone are upwards of $900 so, if you think of it that way, this is a great deal!! I first saw this in a gossip magazine and had to do some research on it. It seems that, for now, it's only available in Europe but can be ordered online and shipped over. If you're an exercise aficionado and enjoy going for long bike rides with the family, this may just be right up your alley! Check it out!